The good news: I've really been sticking to my new year's resolution and have been hitting the gym more often. The not-so-good news: I wake up sore more often too. Aching muscles greet me each morning and sometimes get worse throughout the day. To the rescue: Naturopathica's Arnica Muscle & Joint Bath and Body Oil--designed to ease muscle soreness and joint tenderness and stimulate circulation in overexerted muscles. That's me--overexerted! After a three-year hiatus (to have my two kids), my newly exercising muscles are definitely working overtime. And the last thing I have time--or money--for is a weekly massage. So I decided to go the do-it-yourself route and rub on this newly formulated Arnica oil for some instant relief (you can also pour two to three capfuls into your bath). Not only did I feel a warming sensation in my muscles but the herbal scent offered great aromatherapy benefits and definitely made me feel pretty relaxed. Hesitant about partaking in herbal delights? Here's the best part: In adopting Arnica, Naturopathica has partnered with the American Botanical Council, an organization dedicated to providing funding to promote the proper use of herbs and phytomedicine and broaden the scope of herbal research. 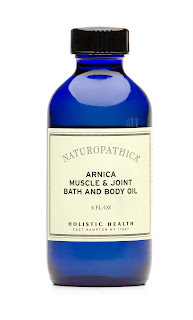 During April, 50% of proceeds from Arnica Muscle & Joint Bath and Body Oil will go to the American Botanical Council. If you can't wait till then to relieve your muscle pain, treat yourself to a bottle now, then buy one for a friend in April when you can give a great gift and promote herb power too. See www.naturopathica.com for more Naturopathica products. Time was when pedicures were strictly meant for trying out the newest shade of polish. But lately things aren't all they were once cracked up to be. With every visit to the nail salon, I began to become a bigger fan of the razor blade and pumice stone--depending on these no-nonsense tools to scrape away the signs of ravaging my feet have endured. Not anymore. I just tried Barielle's new Heel and Callus Treatment Cream ($22) and I'm happy to say, I'm now well-heeled. Thanks to a high concentration of emollients and softening agents like vitamin E, Aloe Vera, Shea Butter, Soybean Oil and Stearic Acid, as well as marine-derived Sea Kelp Extract and Algae Extract, my feet have been magically moisturized. I apply the cream all over after a shower when it absorbs most readily and before I go to bed when it will have plenty of time to sink in. It smooths on easily and doesn't feel thick or heavy like other serious foot moisturizers. The result: Smoother, softer skin...and fewer trips to the salon. Look for it at select retailers or www.barielle.com this spring--just in time for sandal season. I was a highlight junkie. For years, I spent countless hours at the hair salon while layer after layer of bleach was applied to my naturally brunette locks. It was addictive. With each session, I added "just a few more" until I was about as close to blonde as a brunette can get. Then in 2000, I decided to go back to my roots--literally. I was my old self again and I loved it! It wasn't until eight years later, when my first single strands of gray started to peek out, that I opted for another dose of color. I made an appointment for a quick single process and walked out of the salon with my grays under cover and some seriously shiny hair. 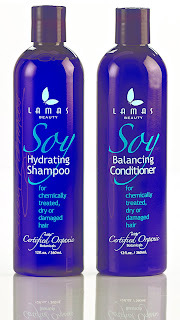 The last thing I wanted to do was ruin a good thing--so when I learned of Lamas Beauty's Soy Hydrating Shampoo ($18) featuring Certified Organic Botanicals for chemically dry, treated or damaged hair, I had to give it a try. The first thing I noticed was that the product lacked any extravagant flowery or exotic scent, which--to me--implied that it meant business. It was designed to do what it's supposed to do. In addition, the clear formula didn't lather up or feel thick when I applied it. Instead, it smoothed botanical nutrients (ie: golden seal, chamomile, carrot seed and yucca) through my hair and rinsed clean without leaving any buildup. Apparently, the soy protein is supposed to reconstruct and strengthen weakened hair shafts. I followed up with the Soy Balancing Conditioner ($18), also for chemically treated, dry or damaged hair. Once blow-dried, my hair looked healthy, sleek and shiny. What more could a girl want? Oh yeah--a discount! Order both on www.lamasbeauty.com and save $3.